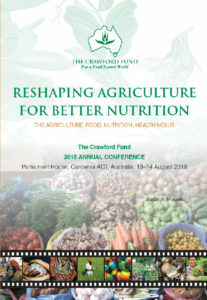 The Crawford Fund’s annual conference is a highlight of Australia’s agricultural development and food security calendar. For almost 30 years we have drawn significant focus to issues worthy of global and Australian attention, and this August we continued that proud tradition. Titled ‘Reshaping Agriculture for Better Nutrition: The Agriculture, Food, Nutrition, Health Nexus,’ our 2018 annual conference was held in Canberra on 13 and 14 August and it asked: how can we feed the world’s increasing population with a nourishing diet that promotes good health and at the same time minimises further environmental impact? Agricultural scientists have long highlighted the plight of the world’s hungry, with their work resulting in yield increases that have fed billions. However, there is increasingly a focus on not just producing more, but producing better, with less. The imperative to reshape agriculture to meet the competing nutritional needs of the hungry, the over-nourished, and the finite resources of our environment will be in the spotlight at our upcoming annual conference. A simplistic calculation of global food needs based on population growth and calorific requirements to satiate hunger tells only part of, or a misleading, story. Rather, we need to look at what are the outcomes sought in terms of health, what agriculture needs to produce to provide the kinds of diet that will lead to these outcomes, what combination of factors and technologies needs to align to support dietary change and, as part of that mix, how can we adapt to deliver sufficient, nourishing food in a sustainable manner. More information on this year’s topic can be found in the topic overview. By attracting the world’s best speakers, providing extended question and answer sessions and opportunities for informal networking, the Fund’s annual conferences allow participants to contribute and to place food security issues into a context relevant to their lives and work. Our conference audience will include the views from science, agriculture, politics, business and civil society to help focus our attention on the way forward. The conference opened on 13 August with our networking dinner and the Sir John Crawford Memorial Address at the QT Canberra Ballroom. We are pleased to have Ms Frances Adamson, Secretary, Department of Foreign Affairs and Trade, to present the Sir John Crawford Memorial Address this year, Food, Climate Change and National Security. Keynote presentations from eminent international public and private sector experts. Targeted overview presentations on the status quo and innovative policy and development project options around reshaping our focus on agriculture for better nutrition outcomes. A set of examples of impact delivered as case studies in short, rapid-fire presentations by leading Australian and international researchers across industries, global regions and agricultural sectors. These Proceedings now provide an enduring record of the conference presentations, supporting further application of such solutions, and include the conference papers, and the Sir John Crawford Address.